For the better part of a year I haven’t felt like myself. I was lethargic, depressed and always on the verge of catching the latest virus circulating around, even though I was taking supplements and eating a healthy diet. After having enough of feeling crappy all the time, I took a food allergy test and found out I had a food intolerance to dairy, gluten and a few other food types. For years I had heard of people talking about the Wheat Belly book and thought it was impossible to live that healthy of a lifestyle. Well folks, my time had come. Long story short, after eliminating gluten out for 30 days, I felt so much better and even lost 15 pounds! While losing weight wasn’t the objective of my elimination diet, I felt so much healthier simply by removing this food types. By far, the easiest vegetable to use when making these healthy “noodles” is the zucchini, but other vegetables can be used too. Here are some that I have tried. I love this cooking tool and it’s perfect for summer salads. I recommend it for anyone looking for new ways to get more vegetables into their diets and this is the perfect time to take advantage of all the wonderful vegetables out in the garden! 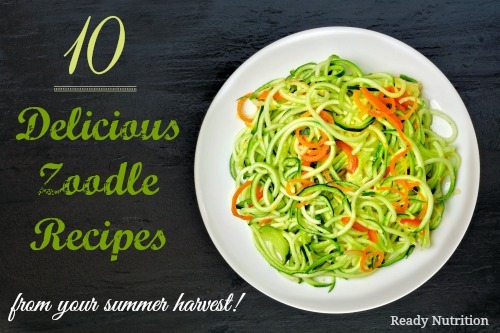 Try some of my favorite zoodle recipes using some of the garden ripe veggies. If these recipes aren’t enough for you to get started, there are spiralizing cookbooks loaded with more recipes. 1 container of ricotta cheese/cottage cheese or make your own with this recipe. In a skillet, add ground beef and brown until cooked. Season, if necessary. Set aside. Take zoodle slicer and cut zucchini into wide ribbons to resemble lasagna noodles. Wipe zoodles with paper towel to remove any additional moisture. In a casserole dish, spoon some of the meat mixture into the bottom of the prepared casserole dish (just enough to cover). Add a layer of zoodles directly on top of the meat. Add 1/2 of the ricotta mixture over zoodles and top with a layer of spinach. Sprinkle 1/2 cup of mozzarella over zoodles. Top the finished lasagna with remaining mozzarella cheese. Bake for 45-50 minutes, until the top is gooey and golden. Note: You can also make a “one pot” meal with these ingredients if you decide not to go through the layering process. In a soup bowl, add all ingredients and enjoy. In a small bowl whisk all the ingredients together for the sauce and set aside. Next, make your zoodles using your spiralizer. Place in a bowl and set aside. Add the peanut oil to a wok and heat over high heat. Add meat and cook until fully cooked. Add garlic to the wok and toss everything together, continue cooking for another minute, if heat is too high, turn to medium high. Push ingredients off to one side of the wok, and crack the eggs in the other side. Using a spatula break the eggs and scramble eggs. Add half the bean sprouts, half the peanuts and half the green onions to the wok then pour the sauce over everything. Toss everything together and continue cooking for a 2 more minutes on low heat. Add the zoodles to the wok, toss everything together and turn off the heat. Serve while warm and add remaining bean sprouts, green onions and peanuts. Garnish with a lime wedge. One of my very dear friends introduced me to veggie ravioli and I have been experimenting ever since! This is a wonderfully light meal your entire family will enjoy! Take zoodle slicer and cut zucchini into wide ribbons to resemble lasagna noodles. Wipe zoodles with paper towel to remove any additional moisture. Set aside. In a large pan, add spinach and basil and top with olive oil. Cook on medium-high heat until wilted. Add in garlic and saute for one more minute. Allow to cool. Add cooked basil/spinach mixture and add to a small bowl along with ricotta cheese. Stir to mix. Assemble the ravioli by placing two pieces of zucchini strips down. Add a spoonful of ricotta mixture and roll. Take two more pieces of zucchini and roll the opposite direction to hold the ricotta mixture in place. Repeat until all zucchini, ricotta and spinach has been used. Place zucchini in a large oven-proof pan and bake for 20 minutes. Remove from oven and top with tomato sauce and cheese, if desired. In a small bowl, mix together 2 tablespoons of artichoke marinade with apple cider vinegar and lemon juice. Set aside. In a large bowl, spiralize zucchini and carrots and add remaining ingredients. Add dressing and stir until incorporated. In a mixing bowl, add ingredients to make peanut sauce. Set aside. Using a knife, cut out seeds of cucumber and slice into half (long ways). With your spiralizer, make noodles from cucumbers. In a large bowl, add cucumber noodles and remaining ingredients. Top with sauce and mix thoroughly. Refrigerate until ready to serve. Top with vinaigrette and mix thoroughly. Refrigerate until ready to serve. In a food processor, add all the ingredients together for the sauce and blend until combined. Set aside. Next, spiralize the jicama. Place in a bowl and set aside. Add remaining ingredients to salad bowl and top with desired amount of dressing. Chill salad for an hour and serve cold. Make your zoodles using your spiralizer. Place in a bowl and set aside.In a pot of boiling water, cook spiralized zucchini for 3 minutes until soft. Drain and set aside. In a large skillet, heat oil over medium-high heat. Add garlic to pan and sauté 1 minute. Stir in vegetable broth and cream, juice, salt and black pepper to taste. Meanwhile, Add pasta mixture to broth mixture; toss gently to coat. Garnish with coarsely ground black pepper and lemon slices, if desired. In a pot of boiling water, cook spiralized zucchini for 3 minutes until soft. Drain and set aside. Cook bacon and drain on paper towel lined plate. Remove bacon fat leaving one teaspoon in skillet. Add garlic and green onions cooking for 1 minute. Add red pepper flakes, and shrimp. Cook shrimp until it turns pink. Salt and pepper to taste. Turn the shrimp and add lemon juice and cook an additional 2 minutes. Remove shrimp with a slotted spoon. Add the zucchini noodles and toss to combine. Return shrimp to skillet, along with basil and crumble in the bacon. Toss to combine. Serve with grated parmesan cheese. So there you have it. 10 easy, delicious recipes to get your started using your spiralizer! Happy zoodle maker! This is the silliest article I have ever seen. Where does your shrimp come from? They are still putting corexit (sp?) In the gulf. It’s extremely toxic. We don’t eat anything from the gulf or the Pacific.